James Marsh is a brilliant artist who brings out things that weren’t scripted. I witnessed my first film of the Florida Film Festival tonight, Project Nim. Talk about a truly stunning evolutionary process. James Marsh directed this documentary based around raising and nurturing a chimpanzee, Nim, as a human child. Nim Chimpanzee was an intentional take on the name Noam Chomsky the famous American linguist, because the goal of Project Nim was to see if animals could learn word order language and sign language. This was such a great experience. Despite the heartlessness of Herb Terrance, the Columbia University professor in charge of the study, Chimpanzees appeared to be extremely humanistic. This was not the first time Stephanie has seen the film with an audience and she said, “people don’t know how to react. It always leaves them stunned.” In fact, I did feel speechless by the end of the movie. I could tell that others had the same experience. What do you make of a film where the lead admits to raising a chimpanzee as human by breast feeding him? I was fortunate enough to be able to interview both Stephani and Bob Ingersoll, another character in the film who worked tirelessly to rescue Nim after he was sent to an NYU lab for medical experiments. Stephanie said this was her chance “to make amends for what we did with them and Marsh made a film that I’m very pleased with.” Marsh took raw material and manipulated it to convey an experience–and he did it well. What a great way to start my adventure. 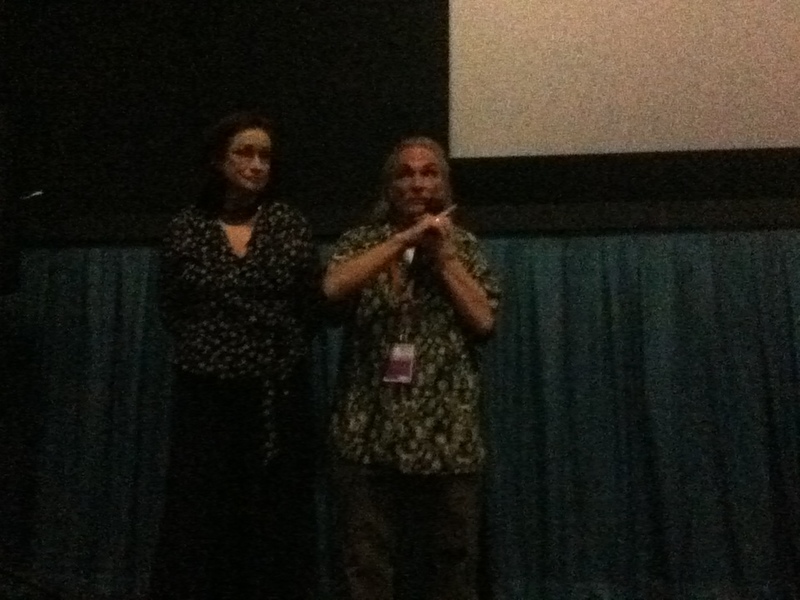 At the end of the movie, Stephanie and Bob stood up for some Q & A. At this point, my colleague, LanceAround raised his hand and was called on. A tense silence descended on the audience as LanceAround asked, “Do you believe humans have a soul and, if so, do you believe Nim had a soul?” The tension was broken as, after a thoughtful pause, Bob said, “I’ll let Stephanie answer that one.” Unable to contain himself, however, he quickly pulled back the microphone and said that he’s a messed up Catholic and that question is a religious, political one but that whether or not he believed Nim had a soul, the love he had for Nim was real and the love he felt from Nim was just as real. Stephanie said she is the exact opposite of Bob, without going her first 30 years stepping foot in church. “If humans have a soul, then Nim had one,” she proclaimed. This entry was posted on April 8, 2011 at 11:21 pm and is filed under Art Community. You can follow any responses to this entry through the RSS 2.0 feed. You can leave a response, or trackback from your own site.